Become an aspiring doctor in this intense but funny medical drama. "I love this game and had a lot of fun playing it. The graphics are terrific and so are the characters. This is the best game I have played so far! I love it and would buy it again. Anyone who buys it will have a great gaming experience. Worth every penny!" When Allison receives a phone call from her mother, she doesn't know what to think. She hasn't seen her mom in over 20 years. Why would she contact Allison after all this time? And what could she want? Allison is left with no choice other than to face her past, in order to discover her future. Will she have the strength to cope with everything that has happened and all that is yet to come? There's only one way to find out. 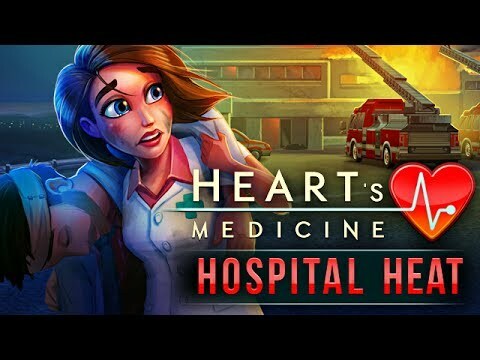 Learn more about Allison's past, experience the ups and downs of her love-life, enjoy awesome interactive cut scenes set to an amazing soundtrack, and get caught up in the fire of Heart's Medicine: Hospital Heat. This is the third Heart's Medicine I have played and I must say that each chapter plays more and more like a television drama. This particular chapter was nice and long. I played it all in two days and was upset that it ended so soon. I hope you guys make some more as I would like to see the two main characters get to know one another much better and possibly marry. Very good group of games -- enjoyed it tremendously! Love this amazing game. Has very interactive characters that are detailed. Great gameplay and so many levels to choose from. I always look forward to new additions of the Heart's Medicine series and Hospital Heat did not disappoint. The usual enjoyable gameplay with new drama for us to enjoy as Allison's story continues. I really enjoyed this game of the series. I think it is the best yet. I hope more will be made just like the Delicious Emily games. I like the story line, it does have more mature connotations. Also, further on in the game it does become more difficult; I like the challenge. This is by far my favorite game yet! So addicting, can't stop until I reach the highest level for each time. Like it much more than the Delicious Emily games. Love, love, love this game. Lots of great mini games, great graphics and an exciting story line. Highly recommend -- 10 out of 10. This is a great game. Could add a little conversation in the cut scenes but other than that, it is like a game soap opera. This game is exactly what I expected, with action and heart-stopping emergencies. I love games like this.